The first stamps of Finland appeared in 1856, at a time when Finland was still an autonomous Grand Duchy within the Russian Empire. Finnish stamps issued between 1856 and 1860 are denominated in Russian Rubles (1 Ruble = 100 Kopecks). Finnish stamps issued after 1866 are denominated in Finnish Markka (1 Markka = 100 Pennia). The two major-denomination-type stamps of Finland shown above were issued between 1856 and 1859. The stamps are typographed on unwatermarked paper of various types, and they are imperforate. The common design features the Finland Coat-of-Arms, along with post-horns and the denomination, within an oval. 05 K. (1856 - Sc. #1) - Blue. 10 K. (1856 - Sc. #2) - Rose. 10 K. (1858 - Sc. #2C) - Rose, Carmine. 05 K. (1858 - Sc. #3) - Blue. 05 K. (1859 - Sc. #3B) - Blue. 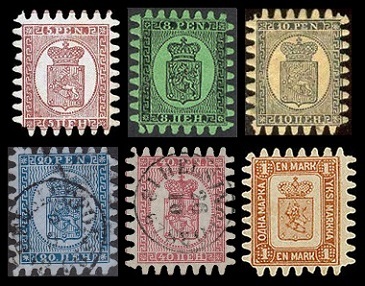 All of these stamps also exist in tête-bêche pairs, and as such they are all extremely rare. Reprints were made in 1862, on yellowish paper, and in 1871, 1881, and 1893, on yellowish or white paper. See the specialized catalogs for details. They are inexpensive. The first stamp separation methodology used by the stamps of Finland was Serpentine Rouletting, usually with gauge 7 1/2 or gauge 8. The indentation depth between the teeth was so extreme that the individual stamps looked very odd. This methodology worked, but separating the individual stamps from the sheet often resulted in mutilated or missing teeth. Examples of the four Serpentine Roulette types are shown, beginning at the top of column three. The two major-denomination-type stamps of Finland shown above were issued during 1860. The stamps are typographed on unwatermarked paper, and they are serpentine rouletted. The common design features the Finland Coat-of-Arms. 05 K. (1860 - Sc. #4) - Blue on Bluish. 10 K. (1860 - Sc. #5) - Rose on Pale Rose. 05 K. (1860 - Sc. #4a) - Blue on Bluish. 10 K. (1860 - Sc. #5a) - Rose on Pale Rose. The six major-denomination-type stamps of Finland shown above were issued between 1866 and 1874. The stamps are typographed on unwatermarked paper, and they are serpentine rouletted. 05 P. (Sc. #6) - Purple Brown on Lilac, Red Brown on Lilac. 08 P. (Sc. #7d) - Black on Green. 10 P. (Sc. #8b) - Black on Buff. 20 P. (Sc. #9b) - Blue on Bluish. 40 P. (Sc. #10d) - Rose on Lilac Rose. 05 P. (Sc. #6a) - Purple Brown on Lilac, Red Brown on Lilac. 08 P. (Sc. #7b) - Black on Green. 10 P. (Sc. #8a) - Black on Buff. 20 P. (Sc. #9a) - Blue on Bluish. 40 P. (Sc. #10b) - Rose on Lilac Rose. 01 M. (Sc. #11a) - Yellow Brown. 05 P. (Sc. #6b) - Purple Brown on Lilac, Red Brown on Lilac. 08 P. (Sc. #7) - Black on Green. 10 P. (Sc. #8) - Black on Yellow. 20 P. (Sc. #9) - Blue on Bluish. 40 P. (Sc. #10) - Rose on Lilac Rose. 01 M. (Sc. #11) - Yellow Brown. 20 P. (Sc. #9c) - Blue on Bluish. 40 P. (Sc. #10f) - Rose on Lilac Rose. 05 P. (Sc. #12b) - Red Brown on Lilac. 10 P. (Sc. #13b) - Black on Buff. 05 P. (Sc. #12a) - Red Brown on Lilac. 10 P. (Sc. #13a) - Black on Buff. 05 P. (Sc. #12) - Red Brown on Lilac. 10 P. (Sc. #13) - Black on Buff. 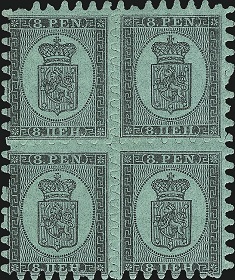 Reprints of the wove paper stamps were made in 1893. The colors are a little different, and they all have serpentine roulette Type IV. They are relatively inexpensive. Color errors exist for the 5 P. and 10 P. denominations on laid paper. They are extremely rare. Depth 1 - 1 1/4 mm. Depth 1 1/2 - 1 3/4 mm. Depth 2 - 2 1/4 mm. Depth 1 1/4 - 1 1/2 mm.